Download "MnDOT Project Management Office Presents: Schedule Updates. Presenter: Eric Costantino Senior Schedule Consultant DRMcNatty & Associates, Inc."
1 MnDOT Project Management Office Presents: Schedule Updates Presenter: Eric Costantino Senior Schedule Consultant DRMcNatty & Associates, Inc.
10 Introduction to Webinar A quality schedule only remains effective with proper execution & timely updating. Learn the techniques and potential pitfalls in maintaining and updating a good schedule thru the Progress Spotlight feature in P6. 15 Data Date The data date is the last date you recorded progress in the form of actual dates, percent of work completed, revised remaining duration, or actual quantities or costs Activities are scheduled from the project data date, using the project start date as the initial data date At the first update the data date will be the beginning of the schedule Be sure to change the data date and reschedule a project each time you record progress for activities. During the project, the data date moves forward toward the project completion date. The actual dates can serve as historical data for planning another project. By default, the data date is set to the beginning of the day. 29 Questions or Comments Tom Wiener MnDOT Project Management Office Peter Harff MnDOT Project Management Office Next Webinar: Wednesday, May 01, 2013 Time: 1:00 p.m. Topic: Project Reporting Presenter: Jonathan McNatty DRMcNatty & Associates, Inc.
31 Glossary of CPM Terms Activity - An individual work task that is the basic component of a project. Activity Codes - Values assigned to project activities to organize then into manageable groups for updating, analyzing, reporting, plotting, and summarizing. Actual Cost - The cost incurred to date for a resource or activity. Actual Dates - Start (AS) and Finish (AF) dates that you record for an activity that has progress or is complete. Actual Quantity - The amount of a resource used to date. Backward Pass - The calculation of a network's late dates. Bar Chart - The graphical display of activities according to time. Relationships between activities are not shown. A bar chart is also called a Gantt Chart. Baseline Schedule -The original planned schedule for a project. Budget - The estimate of the total units or costs required by a resource or cost account for an activity. 32 Glossary of CPM Terms Calendar - The workdays and holidays defined for a project that determine when an activity can be scheduled. Completion - The date on which a project is to be finished. Constraint - A restriction imposed on the start or finish of an activity. Critical Activity - An activity that has the least amount of total float. Critical Path - The series of activities in a project that will take the longest to complete. Critical Path Method (CPM) - The calculation of the earliest and latest start and finish dates of activities based on their duration and relationships to other activities. Data Date - The date used as the starting point for schedule calculations. Driving - A predecessor/successor relationship in which the predecessor Relationship - Determines the successor's early dates. Duration - The amount of time (in workdays) needed to complete an activity. 33 Glossary of CPM Terms Early Start (ES) - The earliest date when an activity can begin after its predecessors have been completed. Earned Value - The value of work performed rather than actual work performed. Exception - A day when work must occur that was originally designated as a nonworkday. Finish to Finish - A type of relationship in which a successor activity finish depends on its (FF) predecessor activity's finish. Finish-to Start - A type of relationship in which a successor activity can begin only when its (FS) predecessor activity finishes. Float - The amount of time that the start or finish of an activity can be delayed without affecting the project finish date. Forward Pass - The calculation of the network's early dates. Free Float - The amount of time that an activity's early start can be delayed without delaying the early start of a successor activity. Lag - An offset or delay from an activity to its successor. Late Finish (LF) - The latest date when an activity can start without delaying the project's completion. 34 Glossary of CPM Terms Late Start (LS) - The latest date when an activity can start without delaying the project's completion. Loop - Circular logic within a network. Milestone - An activity that represents a significant point in time, that has no duration. Negative Float - The total number of days that the start or finish of an activity exceeds the time allowed. Negative float indicates a delay in the schedule. Negative Lag - An offset or lead time from an activity to its successor in which the successor's start date is earlier than the predecessor's start date. Network - The series of activities required to complete a project. Nonworkperiod - A period of time when work may not occur. Open End - An activity that has no successor or predecessor relationships to other activities in the network. Out-of-Sequence Progress - Work completed for an activity before it is logically scheduled to occur. Percent Complete - The proportion of an activity that is complete. 35 Glossary of CPM Terms Performance Measurement - The comparison of the current plan to a target plan to assess whether it is progressing as intended. Planning Unit - The increment of time used to schedule a project. The planning unit can be in hours, days, weeks, or months. Predecessor - An activity that must logically occur before another activity. Progress - The completion of work. Resources - The people, materials, equipment or services required to complete a project. Schedule - A list of the activities needed to complete a project, along with their start and finish dates. 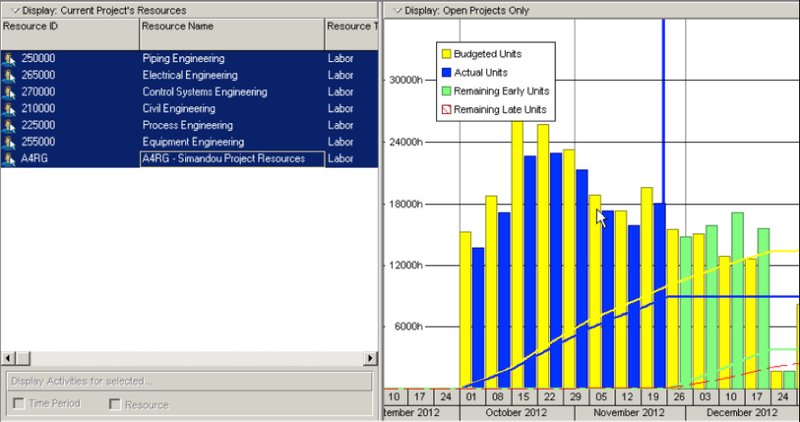 Schedule Calculation - The calculation of early and late dates for each activity in the project. Slack - See Float. Slippage - Lateness determined by measuring the target finish of an activity from its actual or current early finish. Sorting - The arrangement of data in a specific sequence. 36 Glossary of CPM Terms Start-to Start - A type of relationship in which a successor's start depends on the start of (SS) its predecessor. Status - The process of updating a project by indicating progress at regular intervals. Successor - An activity that must logically occur after another activity. Target - A project plan that can be compared to the current schedule to measure progress. Task - A unit of work. Also called an activity. Total Float (TF) - The total number of days that the start or finish of an activity can be delayed without affecting the project finish date. Float can be negative,zero, or positive. Updating - The process of recording progress in a project at regular intervals. Variance - The difference between the current and target schedule dates. Work Breakdown Structure (WBS) - The graphical depiction of the hierarchy of work needed to complete a project. Workday - Any day of the week when work can be scheduled. Should I Resource Load My Schedule?